I just got back from my second time visit Nusa penida, Bali. Not all of tourists know that Bali has 3 separate islands. Located 45 minutes by boat from Sanur Beach, Nusa Penida, Nusa Lembongan and Nusa Ceningan usually have been choosen by travelers to escape from the busy South Bali Area. All of these three islands are separated by the ocean and we have to take the boat to reach each island, except for Nusa Lembogan and Nusa Ceningan, since there is a bridge provided between both of them. 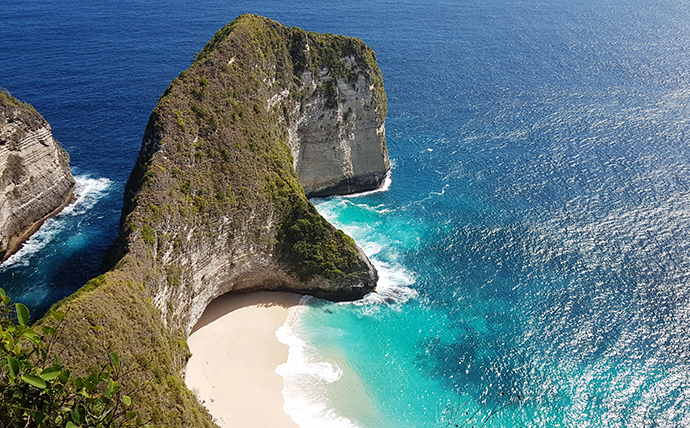 As the biggest island, Nusa Penida has so many beautiful places to explore. On my second visit in Nusa Penida, I got accompanied by my Friend, Duwi, he’s the local and Nusa Penida born. I could say he is such an expert showing me the best spots to proof the beautiful views of Nusa penida. The first breathtaking view is Kelingking Beach. The view of the green hills combining with The blue ocean water, and white sand beach could be seen from above. The picture looks like we were taking a picture with the drone camera. From the parking lot we have to walk down for 100 meter to see this view. You can absolutely go to the beach as the beach looks so tempting ! But you have to make sure you are not afraid of height. The track is steep, slippery and only 50 cm width. So be careful ! As known as the broken beach, what makes this place special is a hole in the middle of the cliff. The water here looks so clear. Pasih Uug is the nearest one you can reach from the pier. Right after Pasih Uug, walking to the right side around 10 minutes you will see a beautiful natural lagoon named Angels Billabong. You can go down to reach the lagoon but the cliffs contained of karst stone, you have to go down slowly. The next of my favorite is Atuh Beach. The view looks like Wayag, Raja Ampat with the single stone exists in the middle of the ocean. Or some of people said it’s quite similar like Nugget Point, Australia. Atuh beach is the furthest location, and the road to get here is so bad. Make sure you come at mid day to get the best light. The track to reach the view is short but steep. Prepare your stamina as you will trekking on the heat. 3. Boat Schedule depart from Sanur to Nusa Penida at 08.30 am and leave from Nusa penida for Sanur at 03.30 pm. 1. Road sign is not available for the destination, it’s quite tricky if this is your first time in Nusa Penida. 3. Internet Connection is edge, I even cannot use google maps properly. 5. You absolutely can go one day trip, but if you are going by yourself, it will take a lot of time. My experience was I took 2 hours from the pier to reach Pasih Uug as I was so clueless how to get to the place. On my second time with Duwi, it’s actually took 45 minutes only to reach this place, embarrassing ! 6. If you want to visit all of those places above you need 2 days 1 night. Otherwise if you want to go for Day Trip, it’s still possible with the destination (Pasih Uug, Angels Bilabong, Kelingking beach) as the last boat to go back to Sanur is at 03.00 pm.